This story isn’t really anything unusual; thousands of people make claims like this and likewise, dozens of them are in Michigan (that I personally know of anyways). Kewaunee Lapseritis, myself and SunBôw TrueBrother are connected with people all over the world that experience this; in America, Russia, Canada, Africa, Europe, China, India, etc. I’m glad to hear this knowledge is becoming more mainstream but someone obviously didn’t do their research before writing this article. It’s nice to see our friend Dr. Igor Burtsev of Russia mentioned here and the work he has done with this case and with the Sasquatch People. Unlike the claims in this article, there is a lot of “evidence” like photos, hair and feces samples but much more than that too… no one ever mentions the bodies that the government already has – why don’t they release the data on those tests? The samples tested by the Sasquatch Genome Project come from various sources (including some samples that we sent in), but Sasquatch DNA can ONLY be extracted if the follicle is attached to the hair, unlike human hairs that do not require the follicle to be tested genetically. The name assigned to this new species is Homo Sapiens Cognatus because they are blood relatives of the human race; the unknown DNA is something not found anywhere on earth. You can research more on Melba Ketchum‘s work if you’d like to learn more about this kind of “proof” instead of taking the scientist’s word at face value. You can see from Jeff Meldrum’s statements in this article that his only focus is money, power, and ego-serving if he thinks that anyone having contact should open a museum and exploit their friends. Anyone wanting to learn more about real encounters, connections, and relationships with the People of the Forest as well as The Sasquatch Message to Humanity to teach humans, you can visit Scenic – Sasquatch Close Encounter Network for Interspecies Communication at www.ScenicSasquatch.com. Bigfoot has always been seen as a scary, yet shy creature that scavengers around in the woods and is rarely seen by anyone. The legend of the Bigfoot can be dated right back to pre-Columbian times when Native American tribes told each other stories of the wild men who inhabited the forests of North America. Back then, the creature had a number of different names, including Sesquac in British Columbia which would later become the modern word Sasquatch that is still in use across the world today. Reports of strange, mysterious hominids can be found all over the world, not just North America, and not just Bigfoot. There are a number of mysteries such as the Yeti or Abominable Snowman that supposedly lives in the Himalayas or the Almas that allegedly stalk the peaks of Central Asia. It wasn’t until the late 1950s, around 1958, that North America really cemented the legend of Bigfoot into its history books and into the public consciousness. Robin Lynn Pfeifer from Newaygo County, Michigan, is stocking up on blueberry bagels from the local store, not to eat though. These sweet treats aren’t intended for her own family of five. Instead, she plans on handing them out to the mysterious, hairy creatures that allegedly live in the woods surrounding her rural home. Apparently, Pfeifer shares the land and lives in harmony with a family of Bigfoot and they’re not as scary as many people believe them to be. Gentle enough to become habituated to humans, according to Pfeifer her and her family have lived together with the family of Bigfoot for years, regularly offering sweet treats and relaxing. The woods surrounding her house are the home to the wild family and is where they meet often. It is unclear whether or not the Bigfoot approach her house but what is clear is that they could be construed as being friends. This is the first instance where the sighting hasn’t been a shaky photograph on a low-resolution camera. Could this be the proof everyone has been looking for? 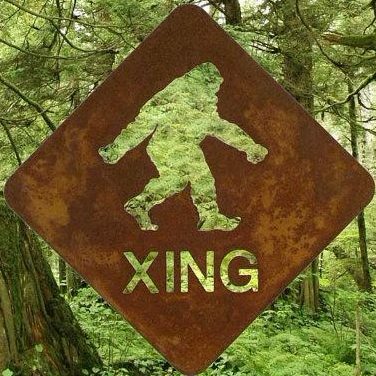 Could this be the legend of Bigfoot? I would like to have the link to the picture of that low resolution photo she or one of her family members took. Was disappointed not to be able to see it, here.